Every year almost 8,8 million hectares of natural forest disappear. The remaining forests are threatened by deforestation for the production of timber, paper, palm oil and soy plantations. Apart from the devastating consequences for our environment and these unique ecosystems, deforestation has a direct effect on the animals living in these forests. Isolation and degradation of habitats and poaching are the most eminent threats to chimpanzees and gorillas. Protection of the forests that are their homes is of the utmost importance to the survival of these apes. The Jane Goodall Institute aims to protect chimpanzees and their habitat around the world. Also in Kibale National Park, Uganda, which is also home to one of the forest projects of Greenchoice. In Kibale National Park, groups of rangers patrol the forest to find snares and remove them. These snares are placed by poachers and are meant for the bushmeat trade. However, they pose a severe threat to chimpanzees who often get caught in the traps with their limbs, which causes them to lose their hands or feet. The rangers have to go deep into the forests to remove the snares and will be disconnected from the rest of the world for days at a time. On their patrol, they use special software on their phone or tablet through which they can register the location of the snares they remove but also for example of trees that have been illegally cut. In order to record this information and send it to the international office of the Jane Goodall Institute, they need to have a reliable source of power for their phones or tablets. Together with Greenchoice and the Jane Goodall Institute, we were able to provide these rangers with a much-needed source of electricity and light. 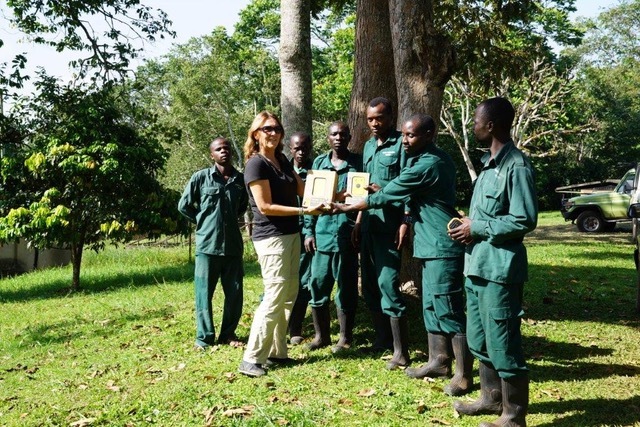 Karin Bloem, chair of the Jane Goodall Institute Netherlands, delivered 25 small but very powerful combinations of a WakaWaka Power+ and a WakaWaka Base to the rangers at the the Kibale Snare Removal Program and the Kigaaga Education Centre. Thanks to these WakaWakas the rangers are much better geared up to enter the forest for long periods of time. The WakaWakas ensure that the rangers will be able to record their data and also have a source of light for when they’re cooking or reviewing their notes after it gets dark around 6 pm. We’re very grateful for this wonderful piece of technology to support us and our work of preventing chimpanzees getting into a snare. Together with Greenchoice (one of the biggest forest protectors worldwide), and the Jane Goodall Institute, we made an agreement to start a structural partnership for the years to come. The Jane Goodall Institute and Greenchoice both work on the same goal: preserving the forest. The first one from the perspective of protecting chimpanzees, the latter from the perspective of reducing and compensating CO2 emissions. However, they both use the same approach; make sure that the local communities are no longer dependent on the forest and can provide for their income through other means. We aim to continue this fruitful collaboration in order to contribute to the protection of forests, biodiversity, and local communities. We’ll continue to build our partnerships over the months to come and we’ll keep you updated. Would you like to contribute to the protection of chimpanzees and their habitats? Become a forest saver or adopt a chimp. More information about the Jane Goodall Institute can be found on www.janegoodall.nl.